Vision Board – My Voice. My Vision. 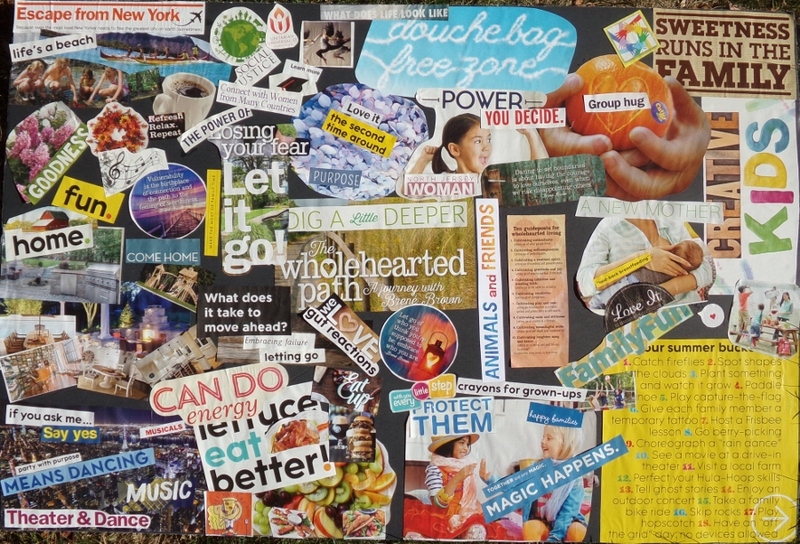 A Vision Board is a name for a collage that serves as an inspirational, aspirational map. The map can be who you want to be or how you want your life to be. Your vision board is a visual representation of your goals and dreams. Why do I think this exercise is important? Did you know that our minds can only hold any 7 pieces of information at a time? In a world where we are constantly bombarded by images and sounds, smells and feelings those 7 things are just a tiny representation of every moment. Our mind learns to filter all of the information to show us what it thinks is relevant so we don’t get overwhelmed. Our minds can only grasp about 7 pieces of information at any one time. Yet, there are millions of pieces of information available to us at every moment (think about everything you can see/hear/feel for starters). To ensure we don’t get overwhelmed, our minds learn to filter information and to only show us pieces of information it thinks is relevant. Have you ever noticed that everyone has a blue Prius after you buy a blue Prius? Exactly. This is how a Vision Board works. Just creating a vision board tells your mind what’s important to you so it can start paying attention to something you may have otherwise overlooked. There are two ways I think to approach this, haphazardly creative or cerebrally. There is something to be said about both. My haphazard approach starts with a stack of magazines. Flip through the magazines and snip anything that represents what you want in your life. This could be a word like “STRONG”, it could be a shiny wood floor or a sports car, a picture of a graduate, a quote that moves you. You can do this deliberately or without prejudice. You could end up with a box of magazine clippings to sort through and that is great! Next go through your image file and find the things that really represent what you envision your future to be. This method is short, playful, and to the point. You may leave the process being really motivated or you may look at your board and think “yep, that’ll do”. The cerebral approach requires a little more thought. Start in a place that is comfortable. Put on your stretchy pants, pour yourself a glass of wine, light a candle, set a playlist, do whatever you need to do to open yourself up to possibility. First think about something you really want. Don’t think about whether or not this is possible, whether you “deserve” it, or its practicality. Imagine having this in your life. My example is owning and living at 496 White Oak Ridge Rd in Millburn, New Jersey. Yes, get specific. Grab a pen and paper and write about what it feels like to have this in the present tense. How does it feel to sit on the deck? What do the blooming cherry blossoms smell like? Are you able to see it? You may not be able to get there for many reasons. A vision statement is an expression of hope, and if you have lost hope it is hard to create a vision. For many of us who have experienced domestic violence we spent years being told “you don’t deserve _____”, “you aren’t worthy of love from ____”, “you are too stupid to work at ______”, “you aren’t talented enough to ____”. You are worthy of hope. You are worthy of love and belonging. Try again. Character: If you could be anyone, what type of person would that be? A social butterfly? More humble? Ballsy? Health and Body Image: What is your healthy ideal? Do you wish you were someone who could eat indulgent foods and not gain a pound? Do you want to be able to run a marathon or swim the English Channel? Do you want to wear a bikini without fear? Would you like to have the curves of Rosemary Clooney or Elizabeth Taylor? Home: What is your dream home? Is it a loft in Los Angeles? Do you see yourself roaming a ranch in Wyoming? Or a beach cottage in the Caribean? If you are like me or many others you have a list of far-fetched and attainable goals. The purpose of this exercise is to discover what it is you most deeply desire. Assume you have it now. How has your life changed? Is it better? Has having this thing made relationships or other goals more attainable or less? What does this say about the underlying needs and desires? Why do you want it? Maybe you dream of a large house so you can have an office away from all of the other activities. Maybe you want that office because then you might have a chance to read that mystery novel you haven’t gotten to. Maybe as a kid you dreamed of being a detective. Have you considered that a career change is something you really want? Do you see where this is going? This will take some time. Like I said, get comfortable! It may take a few attempts. Maybe you really DO want a castle. Is that an attainable goal? Maybe not. But what are some things that you can do to fill that space? There is no right or wrong way to do it. The goal is to better understand what your deepest desires are so that you can act towards and honor them. Now comes the fun part! Take your written work. Grab a piece of poster board, mounted canvas, or anything you might have handy. Get a stack of magazines and some glue and create your vision. Use words, phrases, pictures of things or people, moods, anything that represents the future you envision for yourself. Now go to town! Again, there is no right or wrong way to do this. Don’t compare your work to someone else’s. But you can definitely be inspired by someone else’s vision board. That’s why we share them. In sharing your vision board with others you take responsibility for your future and deepen those relationships. Hang your vision board in your office or bedroom. Put it in a closet and look at it and reflect occasionally. Take a picture and share it with us! The sky is the limit. It’s your vision.